The cuteness factor is awwwf the charts in "Saving Harry," a two-minute animated film by Wildlife Aid U.K. that follows the journey of the titular hedgehog from suburbia back to the woods where he belongs. 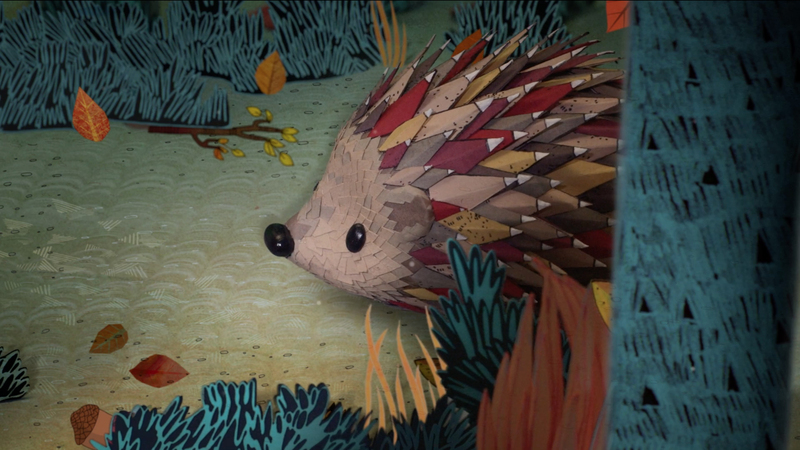 An adorable hedgehog puppet moves through an amazingly well-realized illustrated world. Every element is superbly crafted, from Harry's pale reflection in the puddle to the grimy, discarded food tins and liquor bottles in the alley, and ultimately, the soft sod of the forest floor and ringed bark of the towering trees. "I'm Seeing Stars," the piano-based tune on the soundtrack, performed by the Elephant Rooms, creates just the right mood—slightly somber, but hopeful, too. Some versions of the clip include the vocal track, and the singer sounds a lot like Kate Bush. You can buy the song on iTunes, with all proceeds supporting the cause. Though stylized, the presentation is also fairly realistic. (Thankfully, Harry doesn't sing or bust a move.) This approach underscores the seriousness of the message, as Britain's hedgehog population has dropped to 1 million from 30 million since the 1950s. A tad too real, perhaps, and rather odd, is the sight of Mr. Owl perched on a branch overhead, observing Harry's return to the wild. Owls sometimes prey on hedgehogs. It sent a shiver down my spine(s).